You will love all of the updates and money-saving features throughout this ranch-style home that includes a finished walkout lower level with a full bathroom, space for guests, home office, family room, or whatever you need. The eat-in kitchen, updated in 2014, has maple cabinetry, stainless steel appliances, Corian counter-tops, and a tile back-splash. The first floor bathroom was also redone in 2014. Hardwood floors, wood-burning fireplaces. High-efficiency 2-zone gas heating system, updated electrical. Replacement windows and doors. 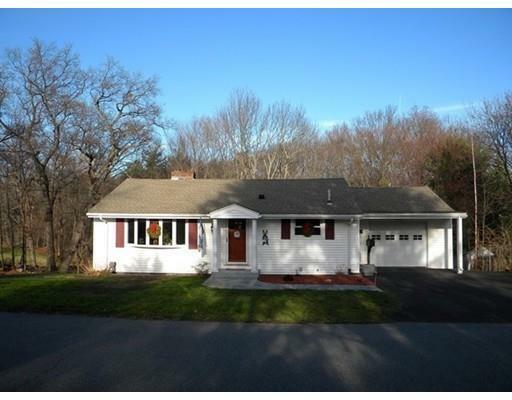 Attached garage, new driveway and walkway, low-maintenance siding, and a private back-yard. Beautifully sited on a 17, 500+ sq. ft. lot. Excellent condo alternative; perfect for down-sizers, first-time buyers, or if you're tired of paying condo fees. Side street location convenient to Maynard Center restaurants, shops, movies, arts, library, parks. Minutes to routes 117, 62, and 27 for easy commuting.